I recently attended a support group meeting of the Celiac Sprue Association and won this snack box to try out. It’s a self-contained meal that is vegan and gluten-free, which is incredibly rare! Plenty of protein, not just carbs. The dark chocolate with sea salt was the highlight. Even though it provides 380 calories, I am not sure this would feel like a full meal to me. It would have been nice to have a napkin in the box. People who like or need prepared foods that are vegan and gluten-free. People needing snacks that need no refrigeration. Dashing through an airport and needing a safe, gluten-free snack. Required FTC disclosure: I won this product, which was provided to the support group coordinator. I was not paid to write this post. Today’s post is part of our mission to help you rebuild your health through food and lifestyle choices. Look for posts on Mondays featuring gluten-free, sugar-free recipes made with healthy plant-based ingredients, Tuesday reviews, Wednesday essays, Thursday how-to’s, and Friday giveaways (when available). 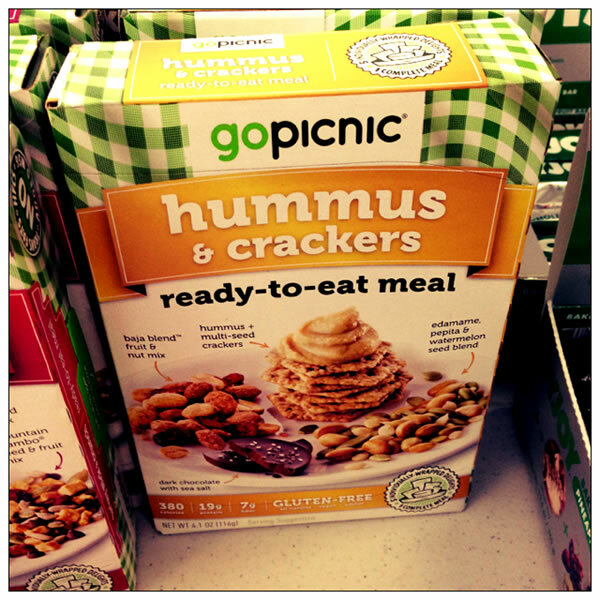 I am so unbelievably disappointed with the gopicnic products. I have Celiac disease and eating GF is extremely important for me and my health. I recently purchased a gopicnic product and after eating almost every pack, I was munching on the candies and scoping out the package when I noticed the ingredients list said “contains wheat” and “gluten free wheat starch”. What!!?? That is a complete oxymoron! Gluten is a protein in wheat and is also found in malt, barley and rye (and some oats) so there is no way wheat can be gluten free. I was so furious and of course I got sick. This is ultimately a result of the FDA ruling that 20ppm is acceptable for GF products but if you have celiac disease, no gluten is acceptable. Also, as a company trying to supposedly help the GF community, why in the world would you put anything with gluten in your products-even if it is claimed to be GF?? This company obviously doesn’t understand what GF means and/or they are just trying to make money of our illness! Thanks for commenting. I would encourage you to write to Go Picnic (I just reviewed the product) to let them know. Hang in there! I tried both this version and the other vegan version and was disappointed in both. The sea salt chocolate was the only thing I liked 🙁 Everything else was stale or tasted horrible. There is also a lot of palm oil in the products – not good if you are an ethical vegan because harvesting palm oil deforests orangutan habitat. Overall, I was very disappointed after initially being excited to find a pre-packaged, shelf-stable vegan item in a mainstream store. I used the go picnic box several years ago when traveling. It was great. I did not really need all the items though. So have since just ordered the packets of hummus and brought my own crackers. The box had a really good trail mix but that I always make and carry myself. Arleen, where do you order the packets of hummus? That also seems like a great solution, less packaging. My hubby eats these for quick lunches when he’s at the library working on his thesis. They’ve been great for us because they don’t require refrigeration and they’re at least semi-healthy. We can only find them at Target so far, but they’ve got a decent selection that I hope expands over time. Agreed Kaitlin! And I so appreciate that they actually have at least one that’s gluten-free and vegan! Good review, haven’t tried mine yet, now I want to, after reading about the chocolate. One of the one of the nut items,, are listed as having garlic and onion, did they seem very much so? How about the hummus, was it spicy? The hummus was not spicy. I didn’t think either nut mix was very garlicky or oniony, but I like both those flavors so I’m not the best judge! The Husband really liked both nut mixes.